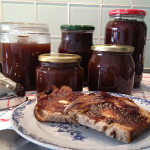 Apple Butter - A childhood favorite, I make this every autumn. I have several friends who actually wait for me to make Apple Butter in batches that I give as gifts. In September and October, it’s apple harvest time. This year our very old apple tree produced apples for the first time in years. So armed with 4 kilos (8 pounds) of our homegrown apples it was time to make a childhood favorite. Available in jars back home, it’s an easy recipe to make at home and wonderful on your buttered toast or with your yogurt in the mornings. Strange as it may sound there is no butter in Apple Butter. This will keep in the fridge for several months. Of course, apples are available all year so feel free to make this anytime you like. Apple sauce apples are best, soft varieties. I am translating this recipe from pounds and ounces to metric measurements. This is a childhood favorite, it's pretty quick to make and can be used on buttered toast, your morning yogurt, pancakes or on your morning oatmeal. It's even good on vanilla ice cream. It's a great way to use up any apples and a wonderful present to give friends. Wash all the apples, remove the stems. Cut up the apples into 6 pieces. You do not need to peel or core the apples. In a heavy-bottomed pot with a lid. Put in all the apples and add the cider vinegar and the brown sugar. Bring to a simmer and allow to simmer for about ½ hour until all the apples have broken down to into a puree. Remove from the heat and push the puree´ through a strainer to remove the skins and seeds. Measure the puree - for every 5 dl add 2.5 dl of brown and white sugar. That's half brown and white sugar measuring 2.5 dl together. Add all the spices and return to the heat and bring up to a simmer. Once hot, pour the puree into a long oven-proof dish and place in a 120 degrees C oven for about 2 hours to thicken. Once the apple butter has thickened remove from the oven and place clean jars in the oven for 10-15 minutes to sterilize. Once done fill the jars, I use a metal funnel made for filling jelly jars. Fill to 1 cm from the top. Screw on the caps and allow to cool. Then refrigerate. I have kept these in the fridge for at least 6 months. The sugar content is so high that they keep very well. This can sound like a lot of work but really it's not. A few minutes to cut up the apples and a few more to strain the puree is really the work. 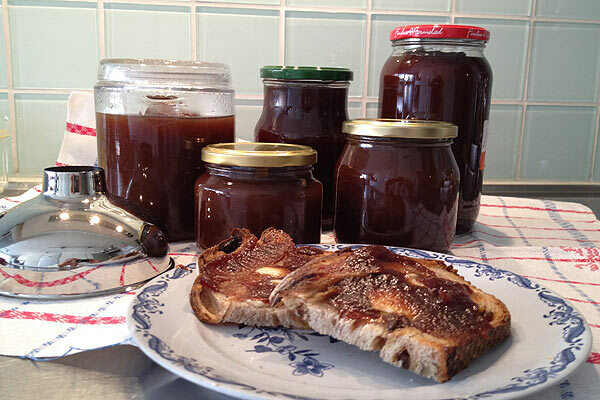 I think it's going to be the best 20 minutes of your autumn and leave you with apple butter that you can enjoy for most of the autumn. You can freeze this in jars or plastic freezer bags and will keep for at least 1 year. As with all recipes that you are going to store for a long time be sure that your jars are very clean and everything that the recipe comes in contact with including spoons and funnels are sterilized.